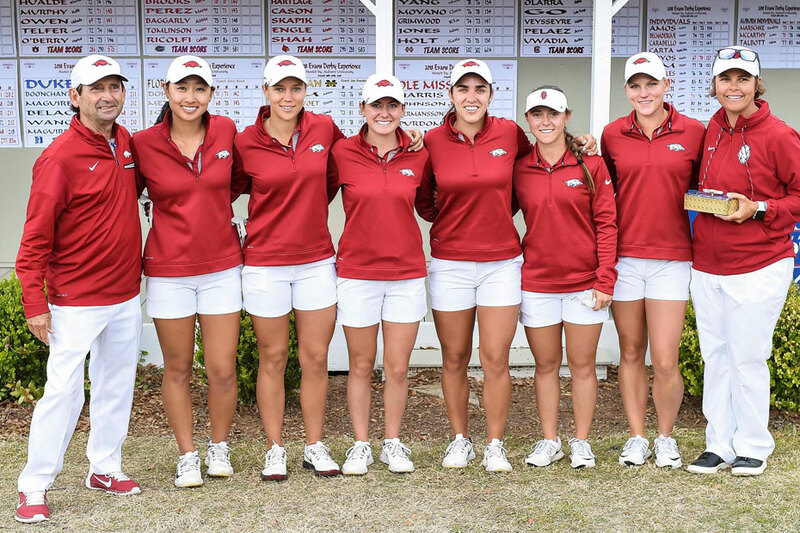 AUBURN, Ala. – A group effort behind University of Arkansas junior Maria Fassi paced the third-ranked Razorback women’s golf team to their fifth team and individual titles of the year at the Evans-Derby Experience on Tuesday. It was another stacked field for the Razorbacks as they wrapped up the three-day event shooting 28-under 836 (280-279-277). Arkansas’ final round 277 was the lowest round of the tournament and the Razorbacks’ score versus par is the second-best mark in program history. It trails the NCAA record-tying 41-under par by Arkansas at the Mason Rudolph Championship earlier this year. Arkansas finished ahead of No. 5 Duke (845), No. 2 Alabama (850) and No. 27 Auburn (863) on the Tigers’ home course. The Razorbacks defeated nine Top 31 teams while Fassi knocked off the second-ranked collegiate player by seven shots. A Palmer Cup International team selection and ANNIKA Award Watch List member Fassi became the second player in program history to win five or more events in a single season with a 14-under 202 (64-67-71). She joins #ProHogs Stacy Lewis who won six events in her senior season (2007-08). Equally impressive was the play of Razorback freshman Maria Hoyos. Playing as an individual, Hoyos finished second against the talented field with a 9-under 207 (67-70-70). She was one of four Razorbacks to shoot par or better in all three rounds. Hoyos and Fassi led the field with 15 and 14 birdies, respectively, as well as in par-4 scoring over the three-day event. Senior Alana Uriell moved up in the final round finishing tied for seventh overall. Uriell counted a 5-under 211 (72-69-70) and shot par or better in all three rounds of the tournament for the fifth time this season. Junior Kaylee Benton finished with a season-best tie for ninth place overall. Benton carded a 4-under 212 (72-68-72). Juniors Dylan Kim (72-78-68) and Cara Gorlei (75-75-68) both rallied in the final round shooting 4-under 68s. The duo tied for 28th overall with a three-round 218 for the tournament. Kim and Gorlei combined for nine birdies and only one bogey in the final round helping Arkansas secure the team victory. • Five team titles (Mason Rudolph Championship, ANNIKA Intercollegiate, Maryb S. Kauth Invitational, Lady Puerto Rico Classic, Evans-Derby Experience) and seven top-4 finishes in seven events. • Five titles is the most in a single season in program history (3 titles in 2010-11 and 2013-14). • Seventeen titles under Shauna Taylor and 23 titles in program history. Taylor has been a part of 21 titles (4 as assistant coach). • Maria Fassi has five individual wins (Mason Rudolph Championship, ANNIKA Intercollegiate, Lady Puerto Rico Classic, Darius Rucker Intercollegiate, Evans-Derby Experience). • Maria Fassi is the second player in program history to win five or more events in a single season. Stacy Lewis won six tournaments as a senior in 2007-08. • Maria Fassi ranks second on the ANNIKA Award Watch List and was selected to the International Team for the Palmer Cup this summer. • Maria Fassi has been Arkansas’ top finisher in five events. She has led the field in 10 of her 21 rounds. • Arkansas played the fall 92-under par for four events. They are 68-under par through seven events this year. The third-ranked Razorbacks tee it up at the Liz Murphey Collegiate Classic April 13-15, in the final event before beginning postseason play at the SEC Championship April 18-22.